Differences in geographic origin of a person's mitochondrial and nuclear genomes due to admixture can affect function of mitochondria, energy-generating organelles located inside cells that have their own separate genome. A new study reveals that mitochondrial DNA (mtDNA) copy number decreases with increasing "mito-nuclear" dissimilarity in geographic origins of the mitochondrial and nuclear genomes (e.g. as the proportion of nuclear DNA from population 1 decrease). Credit: Arslan Zaidi, Penn State. Differences in the geographic origin of genes may affect the function of human mitochondria—energy-generating organelles inside of cells—according to a new study. Mitochondria have their own genome, separate from the nuclear genome contained in the nucleus of the cell, and both genomes harbor genes integral to energy production by mitochondria. The study explores whether these "mito-nuclear" interactions, which are fine-tuned by natural selection over deep evolutionary time, could be altered when genes of different geographic origins are brought together within a genome. The study, which appears online January 14, 2019 in the journal Nature Ecology and Evolution, could have implications for public health and for medical procedures that replace mitochondria in human cells. "Genomes that evolve in different geographic locations without intermixing can end up being different from each other," said Kateryna Makova, Pentz Professor of Biology at Penn State and an author of the paper. "Nowadays, there is so much mixing that pretty much everyone's genome is made up of bits and pieces of DNA that evolved in different locations around the world, which can result in ancestry variation within the genome. For example, many of us carry pieces of the Neanderthal DNA alongside modern human DNA. This variation has a lot of advantages; for example, increased variation in immune genes can provide enhanced protection from diseases. However, variation in geographic origin within the genome could also potentially lead to communication issues between genes, for example between mitochondrial and nuclear genes that work together to regulate mitochondrial function. Understanding this process could have implications for human health." The researchers focused specifically on genes used by mitochondria. To perform their functions, mitochondria rely on genes encoded in the DNA of the mitochondria itself and on genes that are encoded within the nucleus of the cell. 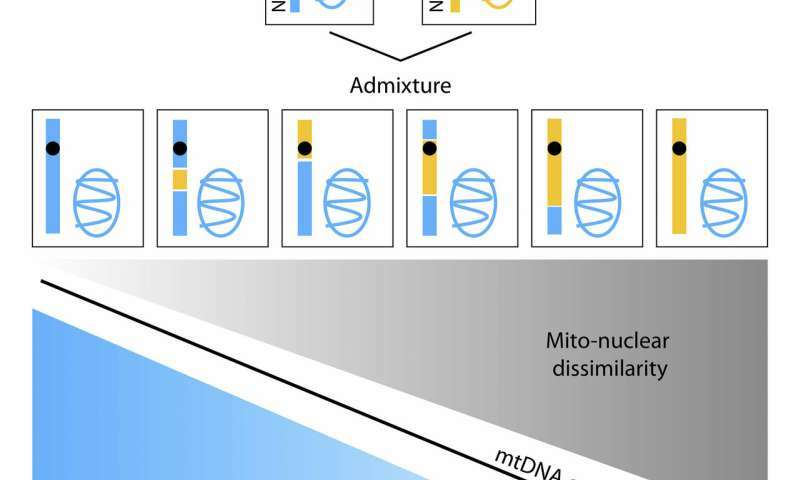 Because mitochondrial and nuclear DNA are inherited in different ways—nuclear DNA is roughly equally passed on from mother and father, but mitochondrial DNA is exclusively maternal—there are greater opportunities for differences in origin of mitochondria-related genes in the nuclear genome compared to genes in the mitochondrial DNA itself. "We observed this pattern across six groups of Americans with mixed ancestry. The specific origin didn't matter, just how dissimilar the nuclear origin was from the mitochondrial origin," said Arslan Zaidi, postdoctoral researcher in biology at Penn State and first author of the paper. "Although these differences in geographic origins are present in all humans, we specifically looked at populations with mixed ancestry because the effects of these differences should be easier to detect in such populations." "In these groups, we hypothesize that natural selection is guiding the trajectory of mitochondria-related nuclear genes, favoring gene variants that are more similar in geographic origin to the mitochondrial DNA," said Makova. "There is likely selection pressure acting on the rest of the nuclear genome in these groups, but there isn't a systematic enrichment towards one ancestry type across all of those genes. In three of the other groups we examined, however, we did not observe this trend, and in one group we actually found the opposite trend. We don't have a good explanation yet, and this really demonstrates the complexity of these kinds of interactions." "To be clear, our study does not suggest that having a particular combination of mitochondrial and nuclear genes would provide an advantage or a disadvantage," said Makova. "But it does tell us that we should keep investigating these differences in geographic origin between these two groups of genes. This kind of information will be particularly useful in medical procedures such as mitochondrial replacement therapy, where patients with damaged mitochondria receive mitochondria from a donor. It's possible that matching the origins of the mitochondrial donor with the patient could improve the effectiveness of these procedures, but future work is needed to know for sure." What are mitochondria and how did we come to have them?